There are some real perks to being pregnant. One is how nice other people are to you. People hold doors for me, let me on the bus first, ask me how I'm feeling, etc. The woman who cleans during the day at work made a special point to stop me in the hall and let me know that if I ever need to use the bathroom to come right in, even if she has it closed for cleaning. It was very sweet of her, although the mental image of my giant belly sliding across a freshly washed floor as I rush into the bathroom will probably keep me from taking her up on the offer. Still, it's nice to feel special, and I'm always grateful to people who make a point to try to make my day easier. Another perk is eating more. As you might guess from someone who blogs about food for fun, I kind of love food. Being told by my doctor that I should try to gain more weight after an appointment where my weight gain was a little backwards was definitely not a sad occasion. Challenge accepted, doctor. Since I was already eating constantly before, I made the sacrifice and added a lot more rich, fatty foods to my diet. To me, that includes this torta rustica with ricotta, pepperoni, cheese, spinach and black olives. It's rough following doctor's orders sometimes. 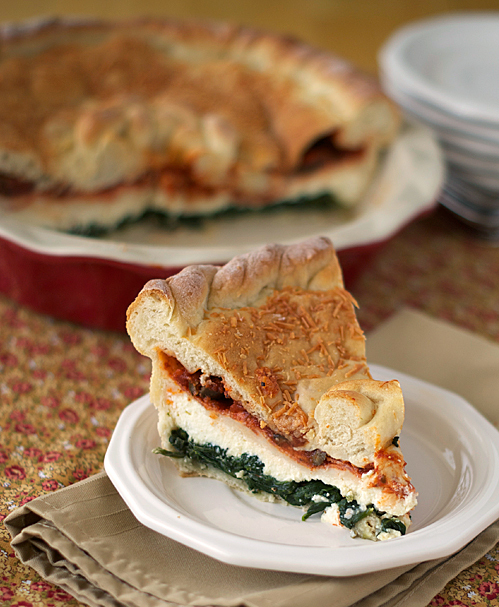 Like a calzone on steroids, it's a yummy batch of cheesy deliciousness in a pizza dough crust. I love the way the layers look when you cut into the pie, and love even more how wonderful they taste together. It's a recipe that you could easily adapt to your own personal tastes, but this is the way that I prefer to fill it. The spinach layer on the bottom just might be my favorite part. Bonus that spinach is fairly high in iron, so I get to pig out AND get some iron in my diet. Being a good patient is really rough sometimes. In a medium bowl, combine ricotta, egg, oregano and black pepper; set aside. In a heavy bottomed skillet without adding water, cook the spinach over medium heat until wilted, about 3-5 minutes. Add nutmeg and salt and continue to cook until the excess moisture has evaporated. Heat oven to 400 degrees. Spray a 9" deep dish pie plate with non-stick cooking spray. On a floured surface, rolled 2/3 of the dough out into a 12" round and transfer to pie plate. Trim excess, leaving a 1" overhang. (You can save the excess to make a decorative braid for the top of the torta if you'd like.) Roll remaining dough into a 10" circle. 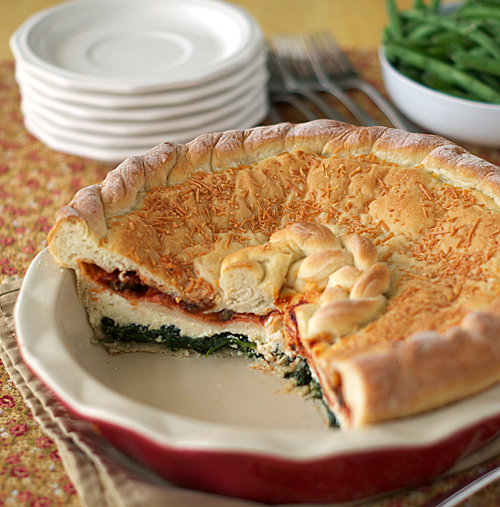 Spread spinach onto bottom crust and spread the ricotta layer over the top. Add mozzarella, sliced olives and pepperoni in layers. Top with 10" round of pizza dough and fold over bottom crust edges to seal. Using a sharp knife, cut vent holes in the top dough layer. Sprinkle with Parmesan and bake until bubbly and lightly browned, 45-50 minutes. Transfer to a wire rack and cool 10 minutes before serving. Two, let's talk about weight gain and how we can get my doc on board with the same advice even though it's not really necessary? Three, I have ricotta that I need to use up and a hankering for pizza... may have to put this one on the menu SOON! Gotta come up with something in the middle other than pepperoni (belch... not my favorite). Maybe chicken sautéed in fajita seasoning to give it some taste? 1) I've seen plenty of pretty food from you to know that's not true. For this crust I just rolled the edges under and they ended up looking like that. 3) You could completely leave out the pepperoni and it would taste fine. Since the other flavors are Italian I would say shredded chicken and some basil would be delicious instead if you want some protein in there. (And I bet you're thinking about protein just as much as me these days.) If you do decide to go with the fajita seasoning, I'd leave out the nutmeg in the spinach. It gives a little hint of something to the final dish that I really like, but I don't know that it would taste good with fajita flavorings. Oh how you taunt me. When is your due date Nicole? Have you said and I missed it? This recipe looks terrific and is just what I need to make for dinner very very soon. Tomorrow! Come visit. We have a terrific Greek recipe today. I don't know that I have said my due date or not. Whoops. It's June 2, so a little less than 7 weeks from now. It seems so close and so far at the same time. This looks AMAZING Nicole!!! Am trying it tomorrow for lunch! Wow - I love the look of this and looking at the list of tasty ingredients I know I'll love the taste of it too, yum!